Rent A Hero is a remake of 7th Hero, a game that I first encountered through a Japanese game subscription service. In this card game, players are trying to collect a band of heroes (each of differing numeric value) in order to win the game. The first player to collect 6 heroes wins. The deck is comprised of 77 cards, 11 each of heroes numbered one thru seven. Each player starts the game with two random different heroes in front of them, and then each is dealt a starting hand of five cards. A starting player is chosen to be the first Active Player. In a turn, the Active player starts by flipping over the top card of the deck and then chooses a card from his hand that matches the strength criteria on the bottom right of the card on the discard pile. The criteria might be “most be odd”, “must be 3 or less”, etc. This chosen card is referred to as the Vagabond Hero for this turn – this is a wandering hero who will join one of the player’s groups of heroes. 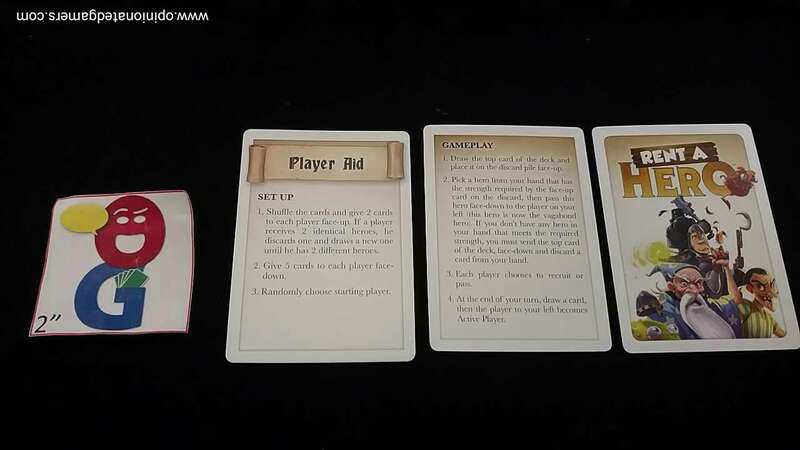 (Note – if the Active player does not have any suitable cards, he must discard a card from his hand and then send the top card of the draw pile around as the Vagabond Hero.) The Vagabond Hero is passed to the Active Player’s left hand neighbor. This player now has a couple of choices. He can recruit the hero by turning it face up and adding it to his collection of hero cards. If the number of the Vagabond Hero is not already in his collection, he keeps the card. If the Vagabond Hero matches the number of an existing card there, both matching cards are removed from the player’s display and put facedown in a pile for Eliminated Heroes. The player could ask for a clue – by passing one of his hand cards facedown to the Active Player with the unspoken question always being “Is this passed card identical to the Vagabond Hero?”. The Active Player only answers with a “Yes” or “No”. The card used for the clue remains facedown so that the other opponents do not know which card was used. You can ask as many clues as you want so long as you have at least two cards in your hand – you cannot use your last card to ask for a clue. The player could use a power – each hero card has a special power that can be used once during the entire game. Once you use the power, rotate that card 90 degrees to show this. These powers can allow you to peek at the Vagabond Hero, prevent another player from Recruiting this round, allow you draw extra cards to your hand, etc. Finally, the player could just decide to pass, and give the Vagabond hero to his left hand opponent. That player now has the same set of choices as listed above. If the card makes it all the way around the table and back to the Active Player, the Active Player is obligated to Recruit that card into this tableau. Once a card is recruited, the Active Player moves one space clockwise and the game continues on. The game ends immediately when a player is able to recruit his sixth hero to his tableau. Otherwise, the game ends when the drawpile is exhausted. At this point, the player with the most heroes wins the game, ties going to the player with the least number of cards in his eliminated heroes pile. Like many games of Japanese descent, this game is a marvel in the complexity of play considering the limited components. While the individual turns do not offer huge decisions in and of themselves, each decision makes a definite contribution to your overall success. The game can immediately end in as little as four turns – each player starts the game with 2 heroes on the table, and thus, one player could conceivably get the first four heroes offered and win the game. While I’ve never seen this happen, I have seen the game end is as little as 3 or 4 trips around the board – though this was certainly the exception to my games. In any event, with the possibility of having only a few turns in the game, you really can’t afford to let an opportunity slip by you. This makes some of the decisions quite hard – and sometimes you have to take an educated guess when deciding to recruit a card or not. It also gives the Active Player an opportunity to bluff a bit with his card choice, perhaps hoping that his selected card goes all the way around the table. You’ll likely only get to use each number’s special action once each game – so while they can be powerful – you’ll need to save their powers for the most advantageous time… but of course, I just told you that you should expect to have a limited number of turns; so don’t wait too long! As I mentioned at the top, this is a re-do of the game. I prefer the new rules, but IELLO has been very helpful by including the two main rules that were changed from the original. First, in the original, when you asked a clue, the unspoken question was “Does the Vagabond Hero’s number match the strength criteria in the bottom right of my card?” as opposed to “are the cards identical?” The other change is that in the original version, the game continued on until a player had six heroes – if the deck ran out, the discard pile was simply shuffled and the game continued on. The first change is an improvement for me because it makes it a lot harder for the Active player to screw up the answer. Sure, it maybe makes decisions a bit easier when you get a “Yes” answer – but it also gives you a lower probability of getting it right. The second change is definitely an improvement for me because it limits the game length to 20-30 minutes which is really about right for this game. 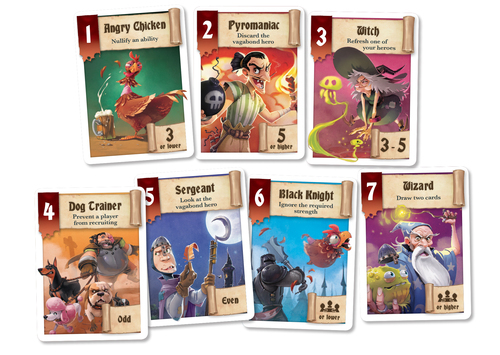 The new IELLO art is great (as most of their recent releases). The drawings by Biboun are filled with color and emotion. This game also includes perhaps the best rendition of an Angry Chicken that I’ve ever seen in a game. 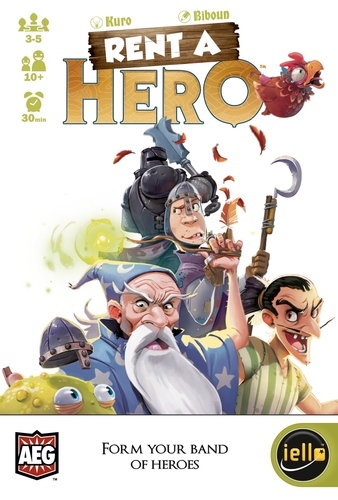 Rent A Hero is yet another great game that is being exposed to a wider audience through the IELLO Mini Games line. Between the high quality of the games and the small format of the box – this is a set of games that I’m reserving space for in my game collection. Peer – it’s a service that no longer exists. In the good old days, there used to be a kind soul who took a limited number of personal subscriptions… you’d send her money about once a quarter, and she would send you packages of Japanese games. Sometimes with translations, sometimes not. I first discovered OINK games through this as well as Sail to India. However, as with all good things, this stopped about a year ago. Lucky for most of us, you can now get a lot of the same games thru to BGG store – at least the “mainstream” ones. I’ll probably never get a chance to get some of the unknown goodies from the Japanese Game Markets until I can somehow trick Eric Martin into saving me some of his luggage space.